Last month was my daughter's 4th birthday. As she's getting older, it's clear that her birthday parties will soon be the one where kids are dropped off, organized games ensue, and it will be generally all about her. That's fair. But up until this point, my husband and I have had a firm belief that when kids are toddlers, the party is really to satisfy the social norm that you should have a birthday party for your kid. For the first few years, she really didn't seem to understand what was going on. It was just one giant play date...with cake and presents. We looked at this as an opportunity to have a party for parents. Us parents who were "lucky ones", had `children who were happy to just play and generally hang out while we had a couple beers and filled our faces with appetizers. All the kids really ate at a party between the ages of 1-3 was cantaloupe, watermelon, yogurt and cupcakes. This year, the requested foods were "lots of hot-dogs, hamburgers and potato chips". Well that's easy. But just hot dogs and potato chips goes against all that I believe in, where my selfish preference for a kitchen full of appetizers is what I really want for my kid's birthday. I decided to tone down my usual spread, but knew that a key component to any successful gathering is delicious meat. Chicken wings. Since I felt that parental satisfaction was being compromised with just hot-dogs and hamburgers, I also thought I should amp up the chicken-wing component. Luckily, the Feburary/March 2016 Taste of Home Magazine had the exact type of recipe I was searching for. 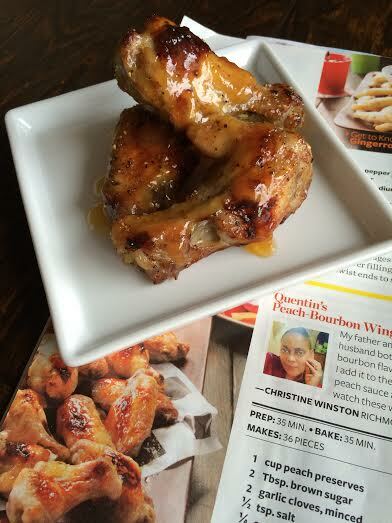 Behold, Quentin's Peach-Bourbon Chicken Wings. 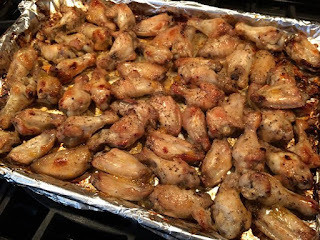 This recipe is a nice change from the usual honey garlic, buffalo, or salt and pepper wings. This is a nice combo of sweet and savoury. Here is a link to the ORIGINAL RECIPE, as found on tasteofhome.com. The only substantial change I made was to add A LOT of freshly, coarse ground pepper. This isn't to say that the recipe wouldn't have been great as is, but this is a big preference for chicken wings in this house. First, preheat your oven to 450F. 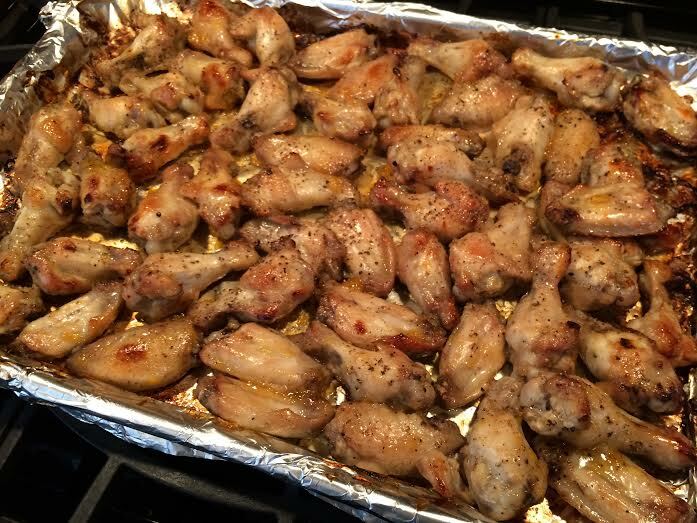 Split 4 lbs of chicken wings and lay them out on parchment lined baking sheets. Bring the mixture to a boil over medium heat, and then simmer on low for about 5 minutes. Combine 2 tsp of cornstarch with 1tbsp of warm water, and stir into the warm bourbon/peach mixture. 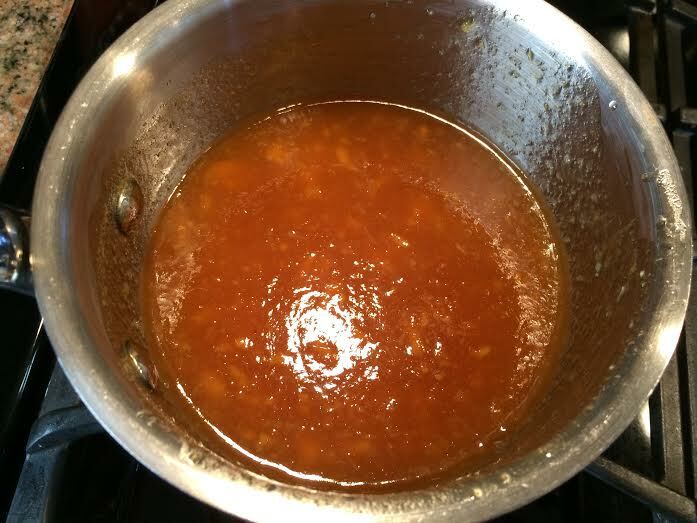 Continue simmering until thickened, about 1 minute. Reserve 1/2 cup of sauce for serving. 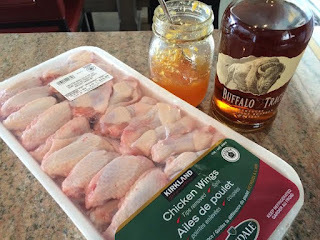 Brush your prepared wings with a layer of the bourbon glaze, and place in the oven. Baste with glaze and flip every 10 minutes, until they are crispy and golden brown (mine required about 45 minutes). With each flip, I gave a generous coating of fresh ground pepper as well. Because the glaze is so sugary, I didn't find it necessary to broil in the final step, as the original recipe suggests. Mid way through baking. Baste, baste, baste! These went over really well. There wasn't a single leftover to be had.